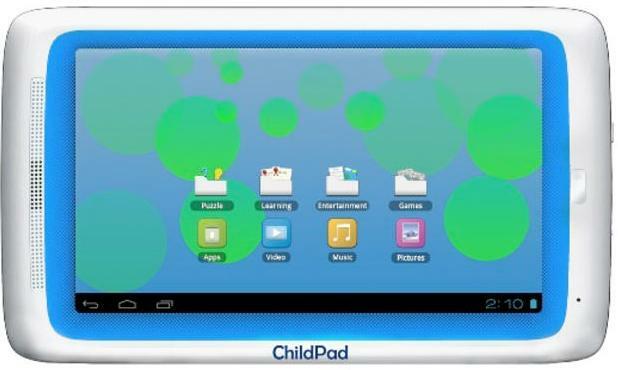 Archos has revealed a $129 Android Ice Cream Sandwich tablet its calling the ChildPad. The 7-inch tablet, naturally aimed at the more youthful tablet user, offers a customised and a more colorful version of Android 4.0 and a lightweight design. However, while it's unlikely to boat the ergonomic awesomeness of the iPad, it's no Fisher Price tablet either as it comes loaded with a 1GHz processor and 1GB RAM. The capacitive touchscreen offers a resolution of 1024 x 600. There's access to 10,000 child-friendly apps through a tailored app store, while favourites like Angry Birds, and Pig Rush will arrive pre-installed on the tablets. The ChildPad is also very big on allowing parents to place stringent browsing controls on the device. The tablet, which will hopefully see a new spate of cheap Ice Cream Sandwich slates, will go on sale at the end of March. Perfect to keep your kids' mitts off your iPad.